Hanoi (VNA) – Shares recorded unexpected downturn on August 2 afternoon following concerns over the detainment of two ex-bankers. On the HCM Stock Exchange, the VN-Index edged down 0.07 percent to close at 786.23 points after peaking over 788 points in the morning. The southern market index expanded nearly 2 percent in the last three sessions. On the Hanoi Stock Exchange, the HNX-Index dipped 0.35 percent to end at 100.97 points. The northern market index gained 4.5 percent in a six-trade rally. Bank shares slipped due to rising investor caution, following the news Tram Be, Sacombank’s former chairman, and Phan Huy Khang, the bank’s former CEO, were arrested on August 1 for allegedly economic mismanagement related to a unauthorised lending of 1.8 trillion VND (80 million USD). 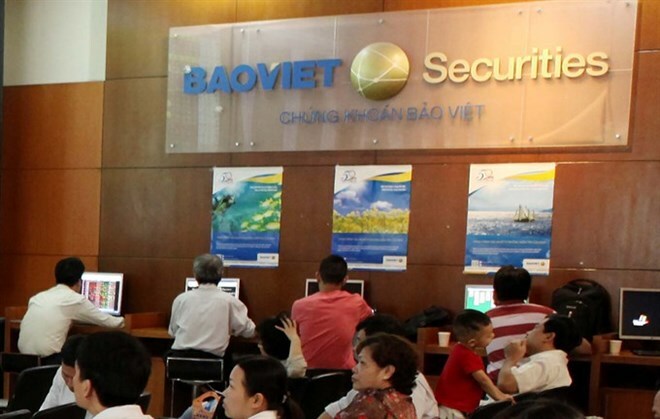 Sacombank shares fell for a second day, dropping 3.5 percent and settling at 12,550 VND a share. Vietcombank (VCB), Military Bank (MBB) and Saigon-Hanoi Bank (SHB) slipped between 0.8-1.2 percent. BIDV (BID), Vietinbank (CTG) and Eximbank (EIB) bucked the trend; EIB rose by a daily maximum limit of 7 percent. According to some securities companies, investors should not be too pessimistic about the information, as difficulties at this bank were revealed a long time ago. On the bright side, many large-cap stocks maintained growth and supported the market. PetroVietnam Drilling and Wells Service (PVD) increased by over 2 percent, while other shares in the list of the 30 largest stocks by market value and liquidity such as Vinamilk (VNM), Petrolimex (PXL), Sabeco (SAB), FPT Corp (FPT) and Masan Group (MSN) ticked up by less than 1 percent. “Selling pressure increased substantially when the VN-Index reached the old peak at 783.81 points, which pushed many large-cap stocks down. The market growth was mainly sustained by some heavyweight shares such as Vinamilk, Sabeco and PVD,” analysts at Saigon-Hanoi Securities Co wrote in a note. They predicted the profit-taking pressure would continue challenging the uptrend of the VN-Index when it is moving towards the 790-point landmark.